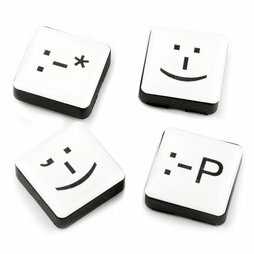 Funny little square magnets with emoticons. A tiny magnet is attached to the backside of the symbols. The adhesive force is still impressive: A single magnet holds 8 sheets of A4 paper securely on the whiteboard. 1 pc. 19,90 EUR ea.